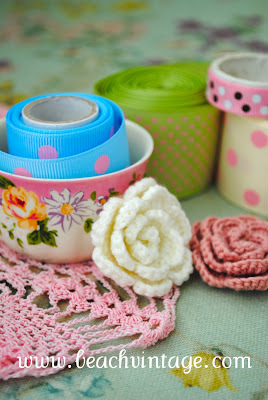 My Monday mind is filled with tea cups, doileys and ribbon. I opened my kitchen cupboard this morning and sighted all these beauties tucked away in a corner. I thought it would make a nice picture to start the week. Sometimes I find inspiration wherever I turn. What are you thinking about today? great way to start the day! !......I'm making a jar of ideas + adventures for the kids as its school holidays in NZ for 2 weeks!! Well, you have me thinking right now I should probably have a look in some of my kitchen cupboards too and dig up some long forgotten stashed away things! But that's for tomorroiw, still sunday here, just yet, and I'm off to bed now! Love all that pretty ribbon! I'm thinking that I'm nearly finished painting my daughter's room and I must make sure I don't get lost on the interent today and waste valuable painting time. I dropped in to your shop last week and it is beautiful. Love the dresses and purses and jewellery. I love your gorgeous ribbons! Enjoy your Monday! I was just looking at doily. I want a pink one. So lovely to be kept away. It´s still Sunday here in Chile and I´m just back from the flea market, very happy!!! I am in the process of completing a year long course on natural skincare and our final assignment due in November is to create 10 skincare products based on, hands, hair, face, body and two of our choice. Today I am thinking about what I am going to create for this homework. My sister-in-law is stopping by on her way home from a Chicago visit in October, soooooooooooo I am trying to get things ready for her overnight with us. Planning for the week ahead too. Sunday evening where I sit, with my cup of tea & many warm autumn flowers filling the house! This may be the last batch to come from the local farm for the season. Lovely find, even better , in your own cupboard:) Monday's always a little hard for me. I need to go find some lovelies and post! Oh yes, definitely it makes a lovely pic, such fresh coulours!! !I love your ideas, always practical and lovely!!! they made me remember my mother who made such lovely items too. It's raining and I'm thinking of fall colors. Nice photo for inspiration indeed! I'm thinking of how the sun is shining and I should be doing some outdoor exercise, maybe horseback riding or hiking. Cute picture, I like all the colour. I'm thinking about switching role within the company I work for, I hope I get it. Well, I was thinking that I have to hop in the shower and get my bahookie off to work...but now I am thinking of your HAPPY photo!And that's a much better thought! Thx!!! hola simonne!!!! beautifull colours and joy to beguin this week!! l love your hat!!!!!!!!!!! !l have a hat for the mountain...and l would love to put a lovely crochet touch!!! !besos simonne and l love your ideas!!!!! !beautifull week!!! It is so great to be able to find inspiration everywhere!!! So lovely, love that pic! I'm thinking I've sort of got the blahs today. Not sure why. The Monday I-usually-don't-have-blahs. But your photo perked me up a bit! I always love the colors in your pictures, Simone!! I'm thinking about how the weather is cooling here & wishing it wasn't so expensive to heat the pool.